Running the Cotswold Way seemed like a fanciful dream to me when the idea came into my head about two years ago. I had done a few off road marathons but 103 miles in one go.. well how would I do that? Strangely though the idea kept kicking around and I found myself doing longer and longer races…. 28 miles off road marathon, an ultra of 43 miles and then I managed 100k in one go. Could the Cotswold Way be possible? Would my club Almost Athletes help me? Fast forward to July 15th 2017. Runners shivering in an 8am rain shower in Chipping Campden, ready to run the first 20 or so miles with me. It was here, the planning, the training, the visualisation techniques, Jules’ Journey running the Cotswold Way was beginning right now! I felt calm, I had my yoga head on and was ready. The trot over to Cleeve Hill was lovely, and made the first of the four marathons that we needed to run. As I live in Winchcombe I saw so many friends shouting encouragement. The rain had stopped and there was lots to eat on arrival at the support van. Our physio team got to work on yet to be tired legs but the sight of massages in the Golf Club car park caused bystanders to form an orderly queue hoping to have their own aches and pains soothed. 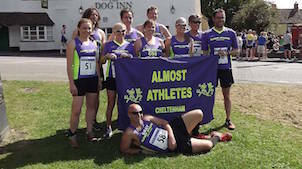 As we went off to cheers we headed over to Cheltenham where some of our supporting runners left us and fresh legs joined. We carried on, changing runners every 10 or so miles, and got to Seven Springs for much needed refreshment. It was around this time that we started seeing chalked messages of encouragement on gates and roads, with flowers in our running club colours. The pop up pensioners had been out and about, some of our older club runners who have done some pretty amazing challenges themselves. It was so motivating. Night was on its way and we had some challenging terrain to cover by the light of a headlamp. The physio team had given us some amazing treatment around 11pm and we shot off into the night, now trying to complete a second marathon. The dawn was most welcome, as we emerged from the dark woods near Coaley Peak where supporters were eager to see how we had coped with night running. The night shift runners accompanied us all the way to Dursley where I had a moment of tunnel vision. It seemed like my body was shutting down but we still had another 40 miles to do. I ate and drank and slowly came back round and then we were off again, climbing a massive hill out of Dursley. So this is how we carried on, food, runners changing over every 10 miles, support van, and chairs for us to just have a rest every 3 or 4 miles. We slowly and surely made our way through fields, hills and roads. We were getting slower and slower and it looked really like we would not make it to Bath, but we kicked with everything we had and got to Old Sodbury. Much needed massage was administered – they told us “you got this”! It was emotional, we had made it to this point with everything we had but the trail wanted more and we had to deliver another marathon to get to Bath. Our supporters and runners did everything they could, feeding us, finding the route, so all we had to do was do what is commonly known as the “ultra-shuffle”. When we eventually got to see the bright lights of Bath the route played with us and messed up our already tired heads as it wound around and around, seemingly never getting any closer to Bath. Bit by bit though, step by step, we made it to Bath. I touched the Abbey door at 2.30am in the morning. It felt beyond belief that we had done it but belief got us there and kept us going. Most importantly it was the belief in the eyes of every runner and supporter that got us through. Almost Athletes is blessed with some amazing individuals who gave up their time for my dream. I really cannot thank them enough and I hope that this event has inspired others to go beyond what they believe.